BRB, making all of my colleagues enter this contest. California Casualty and NEA Member Benefits have designed a program of tailored insurance coverage for education professionals. Together, they're giving back to teachers in a big way! Why is it that school lounges in the movies are always fully stocked with supplies, snacks, and comfy chairs for days? Real teachers know that you’re lucky to find a folding chair and half a ream of paper in most school lounges (if there even is one). Well, all that could change with this amazing school lounge makeover contest we recently heard about. 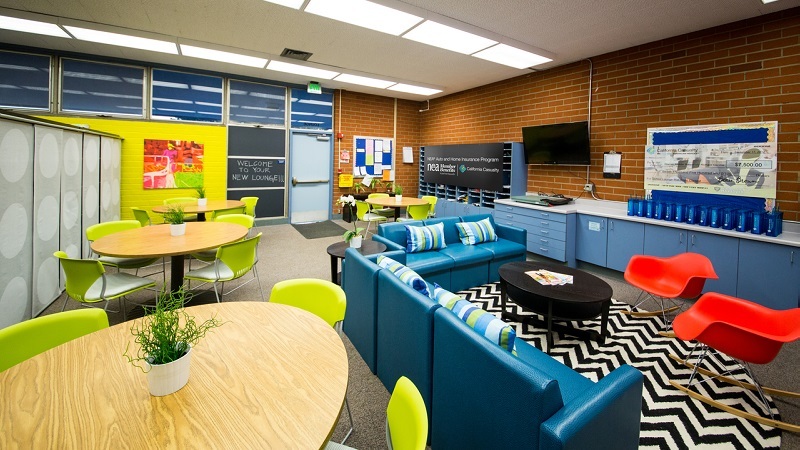 NEA Member Benefits and California Casualty—partners in offering teachers tailored insurance programs—are giving away a school lounge makeover to one lucky school. Their goal is straightforward: to celebrate your commitment and hard work for your students by giving back. We’ll cheers to that! What’s on this makeover agenda? Prepare yourself for a cheerful, calming, stylishly collaborative safe space to catch your breath with your colleagues. Click below to find out how you can win. Spread the word to the staff, too! The more entries from your school, the more likely you’ll be lounging in style. Yes! I Want to Win a School Lounge Makeover!